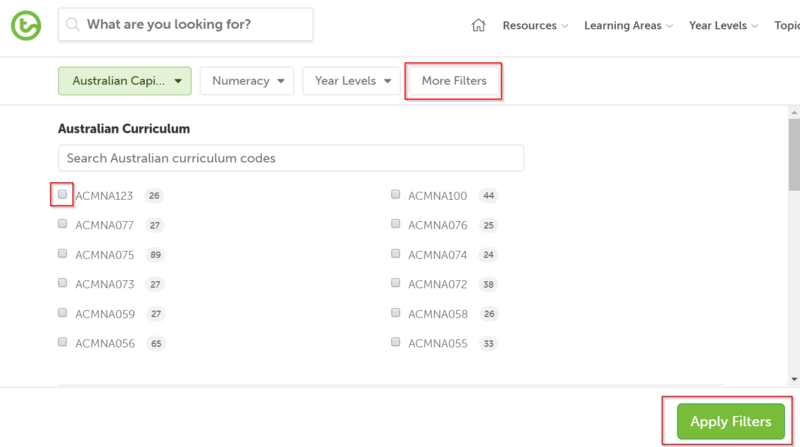 We offer members the ability to filter their searches by curriculum code. If you know which code you work to and would like to filter your searches further, you can type the code into your search bar when beginning a new search and select the relevant code from the dropdown menu that appears. You can also simply select the More Filters button after conducting a search, using the check boxes to select your preferred codes. You can also enter the code you are looking for into the Search Australian curriculum codes box to find the one you are after. Once you have selected your codes, simply click Apply Filters and your search will filter through our resources to only include the ones that align to your requested codes.